Fed up with the disruption caused by utility companies digging up London's streets? TfL are considering fining companies who don't complete work on time. Boris Johnson kicked off a war on holes as part of his Way To Go! initiative earlier this year by insisting on pledges that works will be completed in a timely fashion and getting workmen to cover up holes when they knock off for the day at 3pm so the road can be used. TfL say that 300,000 holes (yes, that does seem like an awful lot) are dug every year without proper notice and it's all as a result of the 1991 New Roads and Street Works Act which was intended to expedite cabling and gives utility companies carte blanche to dig up the roads with as little as two hours notice. What really gets our goat is when one company smooths over the last stretch of glistening fresh tarmac, only for another one to come along a week later and dig it all up again for an entirely different reason. According to the London Assembly Lib Dems website, Oxford Street alone was the unlucky recipient of 176 separate roadworks in one year which surely deserves some kind of award, even if it is for Worst Planning Ahead Leading To Most Disruption. Councils are already imposing fines on companies who outstay their welcome: Thames Water, EDF Energy and BT have all felt the wrath of local authorities after work over-ran and National Grid Gas paid out an eye-watering £815,000 for delays. 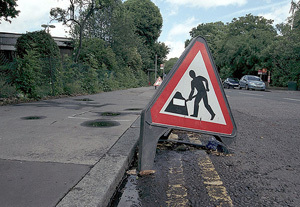 Find out more about who's digging up your roads here. Image / DICKSDAILY in the Londonist Flickr pool.